Name badges are great for high-turnover positions and volunteers. Add a logo to any reusable name badge to make them stand out. Choose from Laser Engraved, UV Color or Hot-Stamped printing processes. Adding a logo to a name badge will help to associate your employees with the brand image you have worked to build for your company. A logo can be added to either a plastic or a metal name badge. Great selection: Plastic or metal and six available fasteners, including deluxe magnet. Free design service: A graphic designer works on each custom product and provides a proof for approval prior to production. Fast, friendly service: Most orders are ready to ship within one to two business days. If you trust to handle your personalized identification needs, we'll be sure that you walk away completely satisfied. Push creative boundaries by adding a full color logo to your badges. UV printing allows for unlimited colors, blends and shading. Space may be left on the badges to add names using labels. Or, use a marker for a more permanent solution. There will be a $35.00 set-up fee; no fee is charged on re-orders of the same layout. Emphasize your logo with premium UV Printing. Quality printing has unlimited colors and gradients. 29 material colors are available. Prices range from $2.18 to $4.07 each. Quantity, size and selected options may affect the price. Your logo will be printed on 0.04 aluminum name tags. Unlimited colors may be printed, including white ink. Material colors: gold, silver or white. Prices range from $3.41 to $6.13 each. Quantity, size and selected options may affect the price. Engraved name tags are durable and economical. Your logo will be the same color as defined by the material selected. Space may be left on the badges to add names using labels. There will be a $25.00 set-up fee; no fee is charged on re-orders of the same layout. A single color logo is created when laser engraving removes the top layer of the two-ply material. Available in 29 color combination including satin, metallic and wood grain. Gold and silver metals, lacquer and mirror colors are available for metal name tags. Choose from 18 metal colors. Prices range from $2.47 to $4.64 each. Quantity, size and selected options may affect the price. Up to three colors may be stamped onto the surface of plastic name tags using metal stamps and heat. Metallic foils and a variety of additional colors are available. Additional time will be required for the production of the metal stamps required for the hot-stamping process. 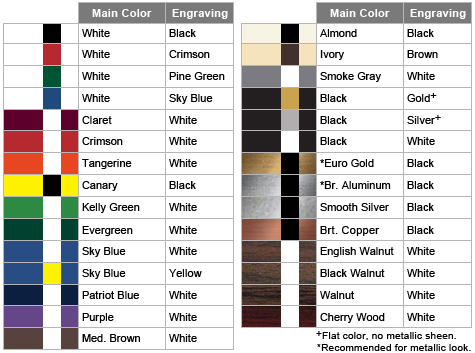 Set-up Fee (includes required metal stamp(s)): $45.00 for one color, $75.00 for two colors, $100.00 for three colors. Reorders: $5.00 for one color, $7.50 for two colors, $10.00 for three colors. Hot-stamping is the only method available to add metallic colors to a logo. Gold, silver, and copper, as well as a selection of satin colors, are available. 29 material colors are available. Name Tag Inc. carries a wide selection of reusable name badges. If you don't see what you want, give us a call and we'll help you find it. Large selection – Low prices! Minimum Order: Five badges. Additional quantity discounts are available, call for information. Price Includes: One 1x3 name badge with logo, standard fastener (pin, swivel bulldog-clip, double clutch). Additional sizes, upgraded fasteners, including deluxe magnetic fasteners are available at an additional cost. Hot-stamped logos are generally used for metallic colors only. If ordering a hot-stamped logo, the logo must meet certain requirements. It must be a one color logo, OR the logo must contain a metallic color option. If neither of these requirements is met, please order your name tag as a UV Color logo. Availability of foil colors may change. If this happens, and you reorder an existing layout that requires a discontinued color, we will attempt to find a close match, but there is no guarantee that this will be possible.